When you buy this product it comes in a neat little DVD case, with Full Pictures and System Requirements. When you open it up you get the CD and a complete installation guide in several languages. When you insert the disc there is an auto start program which guides you straight through the installation, once complete all you need to do is load up Flight Sim and there you go with the Two aircraft in Flight Simulator ready to fly! This aircraft look just like the real thing! I was amazed when I looked up the Cessna Citation X in a book of aircraft even the paint scheme was the same! Sadly I noticed that they had missed the door out. Which is located just behind the cockpit, but who cares, I certainly didn’t. When you zoom into the wheels you can see how they have tried (and tried very well) to make the suspension stand out a little, just like real. As I zoomed into the wheels up above I could see the two pilots in the cockpit! This aircraft includes Turning Engine Fans, Moving Flaps, Spoilers, Elevators, Rudder, Ailerons, and Gear. They all run smoothly as if they’re the real things. This aircraft also includes sounds outside; the normal standing speed is the lovely Jet engine noise. The increased throttle is great, if you turn your speakers up loud it feels like you’re really there. Then the reverse thrusters are also very, very good! This aircraft also includes good Night Lighting Effects, and when you look back to the cabin, out of the windows its the actual FS Scenery not just a picture put there! The Cessna Citation X panel is a Very detailed panel. Firstly it includes Full lights with new switches and lights appear when they’re turned on! Then they have the GPS, NAV, Heading, Altitude, and Speed, which are all a new design. It’s along the same lines as the LaerJet, but still very different. It includes different digital clocks, Now, ETA and ZULU. It also includes Ground Speed digital read-out, which most panels do not include! You can also set DME’s, VOR’s, NDB’s and Airports and the panel will tell you how far from one to another. Very good but still very different to the GPS in standard panels. It also includes Hydraulics’ and Electric ratings that switch screens by pressing the buttons below! Then the autopilot is like the real thing and as complicated, with Y NAV, L NAV and S NAV. Now I still haven’t worked out how to set those up. Just need a lot more practise. It gives you backup Attitude indicator, Altitude, and Heading. There is also a little Warning system above. The panel includes Full Shadows, which makes it look real! Both Panels include 390 degree views! Then you can go to the knee-side panel where there is an Auto-Start button, and Fuel Shut-offs. Flaps Spoilers and Throttle quadrants. A Radio that you are able to tune in, which prevents you keep going to the menu. And a working Flight Computer! Now I have never had a plane with one of these in. But it really does help you plan your route ahead! The only main problem I found was the writing on the dials was a little too small it was hard to read. I also noticed that there was no Temperature gauge, unless I haven’t found it yet? When you have a look back you see the cabin in Full Luxury, with Leather and highly polished tables. What life could be like if you had the money! But too me the Cessna Citation X is a really well designed plane, with Full working instruments and main objects outside! The plane does not need to be improved at all, It is far worth the money, and I cannot find out why it’s only £9.99! It also includes a manual in both English and German, in Adobe Reader, which is also supplied with his Product! With this plane able to land where you want it too, you’re in for a Great time. Now this aircraft is also a Billionaire’s Jet, with Full Luxury wherever you go. Why would you travel by car? The Hawker 800XP is slightly longer than the Cessna Citation X but then again; it can’t reach the top speed that the Cessna can reach! With the engine more-a-less in the same place as the Cessna but a little lower you can see the aerodynamics must be far greater than any other Jet of its kind. This aircraft does include a door, and accurate windows. Too me the cockpit window looks a little large but then again I’ve never seen a Hawker. But when I looked in my book it looks more a less the same. And again I couldn’t believe how real it looks to the book Picture. 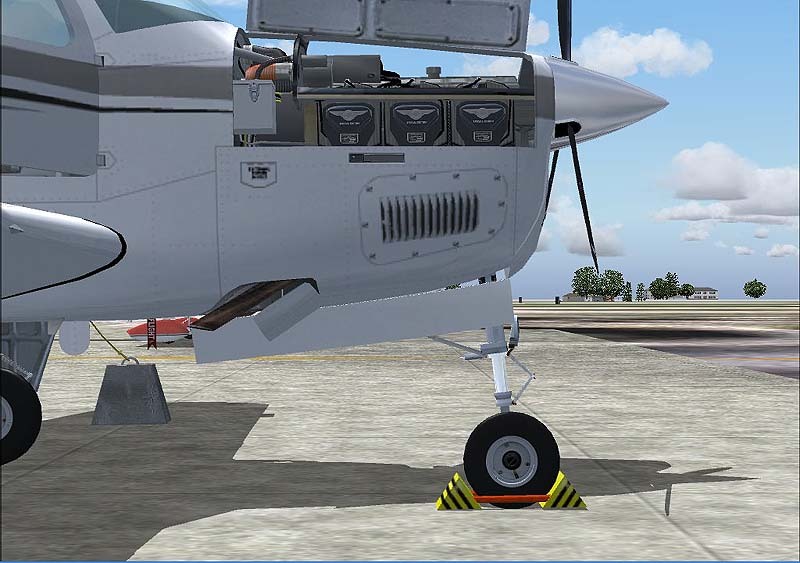 This aircraft also includes full moving parts including Engine Fans, Gear, Flaps, Spoilers, Ailerons, Ruder and Elevators! And again they all run really smoothly. Its Unbelievable to see at first! The sounds are all newly developed from start-up noise to shut down. They’re all really well developed. The first thing you notice when your on the Panel view is that you have a Working Weather Panel, I’m still not sure if it’s the real weather from the last time I downloaded real world or its just a certain weather set to run over and over again. But how it is it’s great! It still has the same as the Cessna Citation X, the Radio panel, Lights, Autopilot and NAV and GPS. They have also added a few engine dials to make it more realistic, and it does! This panel also includes a Temperature Dial, which is much better. Then I noticed that there was a Warning Panel. But again sadly the writing is way to small that I can’t see, but it’s the same warnings all the time. But it does make it realistic. The kneeboard panel is a little more detailed to the Cessna Citation X. With Flap Detail added and Speed brakes. Also when you look into the cabin on this plane it looks even more luxurious. And I ask myself how anyone can afford this plane? The Hawker 800XP is a great aircraft. It can be a little improved but no more than the Cessna can. But then again your only paying £9.99 and what else can you get of this quality for that price! Keep It Going Just Flight! How can anyone afford This Plane? Easy! Go buy it, it’s only £9.99! Phoenix All Of you well done in creating a marvellous Product!